The tree sitters and their direct support received word today that Alpha Natural Resources is suing them for irreparable damages. They are seeking a permanent injunction, compensatory damages and punitive damages. We will keep you posted as we look into this more … stay tuned, this should be interesting! Catherine Ann spent 30 days living in an oak tree in bee tree holler on Coal River Mountain. 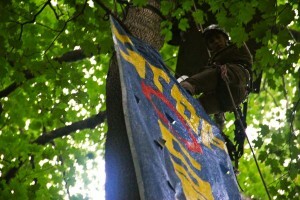 On day 30, limited resources necessitated that she descend and continue the fight against strip mining from the ground. She began her decent in the morning, in the evening she was charged with trespassing and conspiracy and was released on her own recognizance. This is her story of that day. I was determined not to get a littering charge. This urgency didn’t make sense to me until I was finally on the ground, and my security guards radioed in to say so. The scratching voices on the other end then informed us that we were to stay exactly where we were: they had been waiting for me to get out of Becks’s tree so that they could blast, clearly somewhere very nearby. I imagined now that they must have eagerly scheduled a blast that morning as soon as they heard I was coming down, not realizing how long the whole process would take me. I probably delayed the blast for about an hour, and if I had known that such an explosion was waiting on my descent, I may have been tempted to cling to Becks’s tulip poplar, platform or no platform. As soon as I was on the ground, security prepared for the blast by sitting down, and recommended that I follow suit so that I wouldn’t tumble down the steep slope when it went off. Soon after that, we felt the detonation shake the earth. I wished, not for the last time, that I were back in my oak. 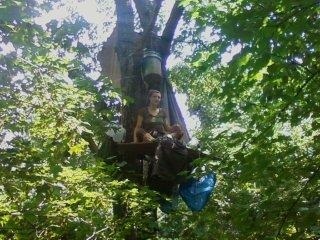 Marfork, W.Va.–Catherine-Ann MacDougal is descending her oak tree on Coal River Mountain that she has lived in for the past month in protest of strip mining, and police have been notified. 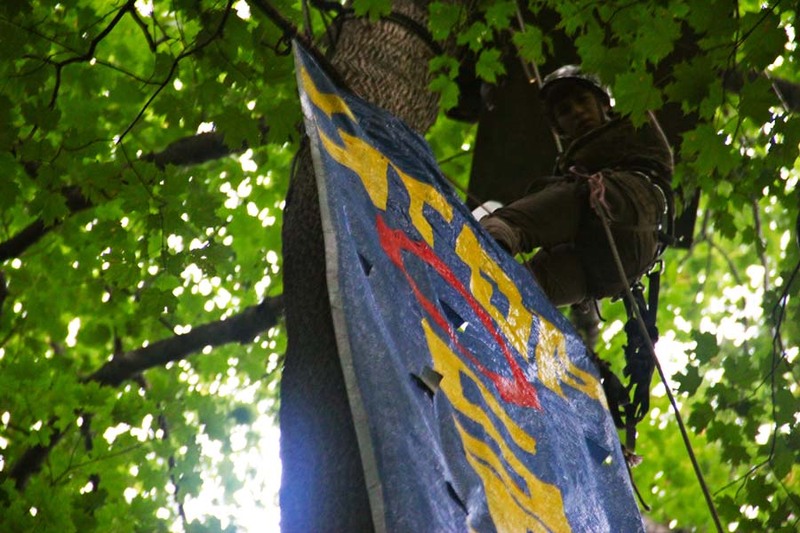 MacDougal, an activist with the RAMPS Campaign, had been in the oak tree on Alpha Natural Resources’ Bee Tree permit since July 20; until August 2, she had been joined by fellow RAMPS activist Becks Kolins. 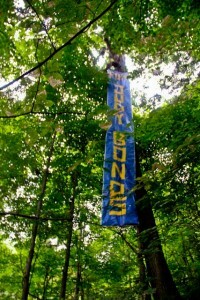 Their tree-sit, the longest in West Virginia history, effectively halted blasting on the Bee Tree hollow portion of the site, aside from a small blast released on the third day of the tree-sit. “The reality of limited resources now necessitates my descent but this is not the last they will see of us. I plan to remain here and fight for this mountain for years to come,” said MacDougal. The Bee Tree permit is the largest active strip mining permit on Coal River Mountain and is currently up for renewal. At a public hearing held last week by the W.Va. Department of Environmental Protection, about fifty residents showed up to ask questions and submit comments. 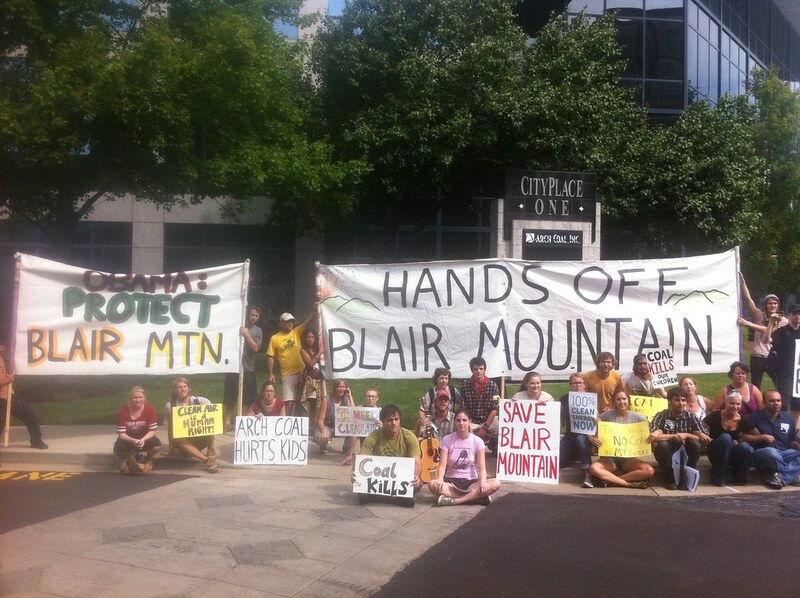 Many discussed their concern over the health impacts of mountaintop removal, blasting near the Brushy Fork Impoundment, and the destruction of the mountains where they and their families had traditionally hunted, fished, and gathered wild plants. 26 Days in the Trees! 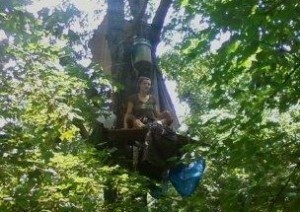 Catherine Ann in her tree-house, taken by Becks. She is enjoying all the creatures she has seen! Yesterday she was once again graced with the presence of another black bear. Also, the tree mouse that had been crawling all over Becks made a nest in Catherine-Ann’s bag of toilet paper. But don’t worry, she’s got enough and doesn’t mind sharing! She told us that she had a fever and was feeling pretty tired, but after drinking lots of water and getting lots of rest, she has recuperated and is feeling better than ever! She continues to stay hydrated and stay dry through the multiple summer thunderstorms. Yesterday evening, the WVDEP hosted a hearing on the renewal of the Bee Tree mountaintop removal permit on Coal River Mountain and on the proposed new Collins Fork strip mining permit. This hearing made it abundantly clear whose side the DEP is on – and it’s not our side. During the hearing, people got a chance to speak with DEP officials and ask questions about the permits and also to record comments in the public record. Many questions that were asked, the DEP representatives were unable to answer. For other questions, the DEP responses made it clear that they were not really interested in hearing peoples’ concerns. One DEP representative went so far as to tell local resident Marilyn Mullens that the DEP “is going to approve this permit anyway,” despite the various concerns that people raised during the hearing. “So what’s the point of having the hearing? It’s just a show,” Mullens said afterwards. Another highlight of the evening occurred when a different DEP representative admitted that he was “against the EPA,” presumably because of their efforts to step up enforcement of the Clean Water Act in the coalfields. Becks Kolins writes about fighting to protect the Coal River Watershed and their experience coming down from living 80 feet up in a poplar tree, being arrested and taken into the jail system. Becks spent 14 days in the trees with Catherine Ann, who still remains in her tree and intends to stay put. Becks plans to take the fight into the legal system and plead not guilty based on necessity. The devastation that coal companies are inflicting on the people and environment in Appalachia is absolutely unjust and wrong. I came down from my tulip poplar late Tuesday morning, my legs wobbly and my body weak from not eating that morning. After two weeks of sitting and enough food to sustain just that, the hike up to the mine to meet the state police was rather treacherous. However, with much encouragement from the manager of the mine, I made my way up the steep, and what was becoming less green, incline, poop bucket in hand. I gasped for air as I set foot on the site; hunched over I was able to see an unbelievable contrast. Bee Tree Hollow, the hollow I overlooked for 2 weeks, is a luscious green, covered in trees of varying size and species, different animals meandering around, and a trickle of a stream flowing next to my tree. The site is brown, gray, dusty. It lacks any sort of animal besides humans and the only trees that could be seen were coming from where I was. This, I thought, this is what I’m fighting against.